With a preview of Super Mario Maker. I started this post last year. The look into the creative process and how they made those original courses from back in the day is interesting though. I don’t think that super Mario Maker for PC’s though, which so that means I won’t be able to play. Back in the early 1990’s was an exciting time for PC games. For one thing the PC had moved from being a strictly IBM platform that was overpriced and essentially used just a monochrome monitor to an open system with many companies making graphics cards and color monitors. Also, the processors had gone from the 8086 through 286, 386 and to the 486 which could handle enough memory to make games viable. So around about 1991 or so we saw a bunch of great games, many of which are still classics. We had Civilization, Master Of Orion, RPG’s and a funky game that was sold as shareware called Castle Wulfenstein, which the very first first person shooter. That game, though and all the others that followed it may never have existed except for a Mario port that was never sold. In case anybody’s wondering where I went for the last two weeks, well I got distracted. I bought a game and it sort drew me in and kept my attention. I haven’t had a game binge of this kind in a long time, if ever. It’s a rare game that can hold that kind of attention for this long. I’ve played computer games since the beginning of the small computer age beginning with my Apple 2. I’ve seen all kinds of games come and games go. That being said, I’m not a die hard gamer. I prefer the various kinds of simulators over violent first person shooters and hyper violent RPGs that run you through morass of blood and guts on rails, where victory comes from dexterity and not strategy. Probably because my lack of dexterity and dyslexia makes those games an exercise in bloody frustration for me. There’s also the fact that those games don’t make you think, except in terms of death and destruction. This isn’t going to be a manifesto on game violence. Or sexism and #gamergate. I’ve played enough Doom that I would be a hypocrite if I whined about how violent games were. And frankly the role of graphics is to sell the fantasy and if human characteristics are exaggerated that’s part of the how things are done. Those kinds of games have their audience and die hard players who like them very much. I’ve played computer games going back to the early 1980’s when the text game, such as the Zork series, was about as good as you could get. Anybody else remember “you are in a maze of twisty passages all just alike?” There were some games with graphics, such as Pong and brickout, but how good could things be on a monocolor screen? There were consoles such as the Atari 2600 but, the best graphics were the art on the box. Dedicated arcade consoles did better, but still graphics were essentially square pixels and your imagination. Graphics were something for supercomputers and to dream about. That changed in the early 1990’s with the advent of the 486 computer and the first graphics cards. Suddenly you could see pictures on the screen that made sense. Back in the early 1990’s was the time when games got creative. The entrance barriers were relatively low and everything seemed to sell. This is when we got Civilization, Railroad Tycoon, Xcom, Sim City and many others. There was also a quicky game called Castle Wolfenstein. This was probably the most creative period of game development and created most of the games that we still think of as the greats. In the late 1990’s that all changed. Budgets and companies got bigger as investors saw the potential for big money. Graphics became the driver over game play and more and more games became driven by what would easily sell. And having great graphics and the work it required to create them raised the entry barriers for new and creative developers to impossible heights. That being said it’s good to see games where you do things other than killing targets. It’s fun to play at building a moon base or a small business. There seems to be more of these types of games coming out lately, seemingly mostly from Europe. 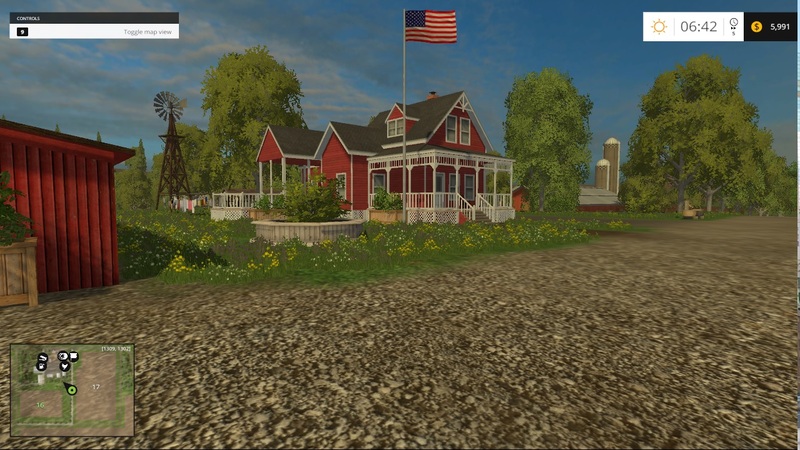 You can operate a garage, drive a truck, transport logs in the Siberian Tundra or run your own farm. And learn how to run a business doing it. 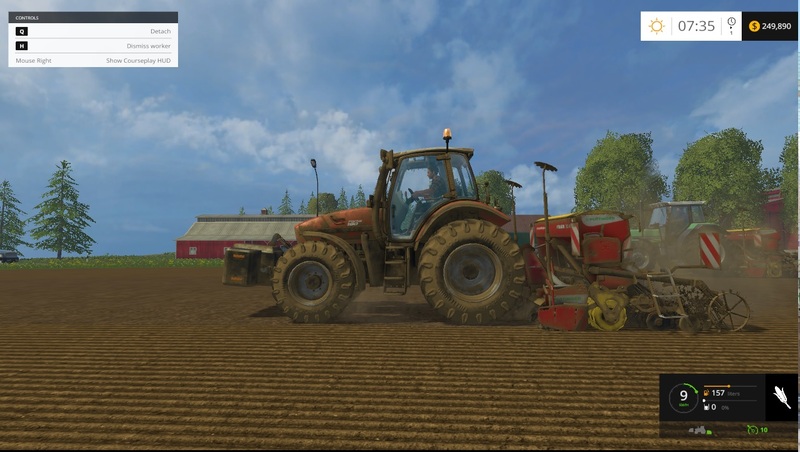 Which brings us to the game at hand, Farming Simulator 15, from Giant Games. This game is a time sink. I bought it on a whim two weeks ago and well, it sort of ate all my time. According to Steam I’ve played over 270 hours, in two weeks. I would look at the clock after dinner and then look at it again and it would be past 2 AM. And I wouldn’t feel tired. This is not a game that you can play for ten minutes and drop. An hour is probably the minimum session and even then, you probably won’t get much done. Two hours or longer works better. That way you can get a planting or harvest done. As your farm grows, you will take a lot of time just making sure that your workers are getting the work done and not sitting next to a cottage romancing Hilda. Like a real business, it’s not that any single action is complicated, it’s the sum of all the decisions you make. And carrying out those decisions. You have to plan around your planting and harvests, decide whether to buy land or machinery, plant new crops or strike out into logging or dairy. You have to find the best price for your crop and decide whether to hold for better prices or sell now to pay the bills or some combination of the two. You also have work out what to do if you make a mistake. All the while keeping an eye on what else is going on. Game play is fairly straight forward. You drive your various vehicles around and either cultivate and plant and then harvest. 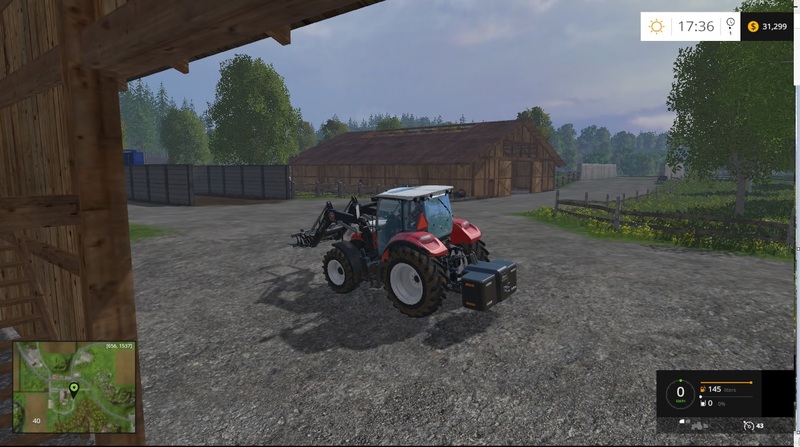 You get three grains to start, though you can move up to corn by adding a new header to your combine and later beets and potatoes, though those require special equipment. If you don’t understand how it all works there are tutorials on the opening game screen for various activities such as cultivating, planting fertilizing, and harvesting. The game also hold you by the hand through the first go around and starts off with your field ready to harvest and your combine ready to go. After that, you’re on your own. How good is the game as a simulator? Well the most of the processes involved in growing a crop are there. There are some simplifications as you don’t have to deal with bugs, fungus or weeds. You also don’t have to deal with farm politics such as deciding to buy seed from the EVIL Monsanto. Also the plant harvest cycle is time compressed to a day rather than six months or so. And the paychecks for the harvest are much larger than they really would be. The game works well. The biggest issue I’ve seen is with the crane and trailer used for logging and it’s weird log physics. Using the game by itself hasn’t caused any issues and the only crashes I’ve had have been because of the Courseplay mod. I haven’t seen a lot of video or stuttering issues and frame rates seem to be fine from my standpoint. So far, the best thing is that even when the game crashed, it did not lose it’s place. Is the game a good return on the dollar? Consider what a blue ray movie, or going out to see a movie costs. The game was on sale for $17.95 and it ate two weeks of my time, keeping me well entertained. And I’m nowhere near done playing. I’m 270 hours or so in and I’m still at the midgame at best. And it’s been fun. You want to see what happens next, what happens if you do this or that. There really isn’t more that you can ask of a game. Recommended, highly. If you do buy the game you WILL want the Courseplay mod. It allows you to automate tasks and helps to prevent game overload. And it’s free. The mod will do some strange things when the computer driver are working off the courses you set and the boundary and object detection need work, but other than that, it’s a very useful tool. There’s a US map too. Here’s a Let’s play video series.